Kate Spall is an unlikely hero. The 36-year old housewife from Chester has become a life-saver to cancer patients around the country. Kate is not a doctor, she has no medical training at all, but she's become successful at obtaining new cancer drugs for patients that have yet to be approved for use on the NHS. Kate's journey began when her own mother was diagnosed with kidney cancer at the age of 56. Pamela Northcott was told by her hospital that there was a drug which could extend her life, but she couldn't have it because it hadn't been assessed by the National Institute of Clinical Excellence (Nice). Nice is an independent body which decides whether many new treatments can be used on the NHS in England and Wales. It was set up in 1999 to give national advice to consultants. 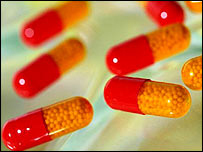 It assesses drugs referred to it by the Department of Health and decides on a drug's clinical and cost-effectiveness. Kate wasn't prepared to take no for an answer. She lobbied and harassed and eventually won the drug for her Mum, but too late. Soon after Pamela died. Kate is extremely critical of the process she went through. Kate told BBC Breakfast: "It's a system of blocking. They're not looking at patients and saying "how can we fund it? ", they are saying, "how can we not fund it?"" Bruce Leverington, who has kidney cancer, approached Kate after he was told a drug called Sutent could prolong his life, but wasn't allowed it on the NHS. Bruce was told if he wanted the drug he could appeal to an Exceptional Case Review Panel. "I was just so shocked and humiliated. I had to go and plead for my life," says Bruce. "They made me feel inferior and that I wasn't worthy of this drug." Bruce found Kate on the internet and she started work on his case. Kate had to prove Bruce was an exceptional case. She spoke to his consultant, went through his records, looked closely at the hospital's appeals procedure. Kate describes the appeals process as complicated, daunting and legalistic. Hard enough to do in normal circumstances, but almost impossible if you're also fighting cancer. [Cancer] medicines are licensed and working, yet we in Britain aren't allowed to access them. While we wait for Nice to decide, patients are dying. Bruce says without Kate's help he would not have succeeded. "I believe she has saved my life. She gave us endless hours of help, endless boosting up when I was down. I cannot describe what she has done for us - for me, my wife and my two sons." Kate has an astonishing success rate. So far, she's taken 52 exceptional review cases and won 50. "It's absolutely outrageous that you will live or die depending on how much you've researched, how much information you have, how well you put that across," she says. Kate is most critical of the amount of time it often takes for Nice to make its decisions. "How ironic that when we're paying for all this cancer research, these medicines are licensed and working yet we in Britain aren't allowed to access them. While we wait for Nice to decide, patients are dying." "The reason it takes time for us to do our job is because we have to make sense of a large amount of complex and sometimes conflicting medical evidence. It also takes time because we make sure the views of healthcare professionals and patients are taken into account when developing our advice. "We could do our job more quickly but we wouldn’t be able to consider the evidence as carefully or consult with patients and doctors as widely as we do currently. This could mean that we don’t make good decisions which would affect not only patients who currently have cancer but all the cancer patients that will need care and treatment in the future. "Our job is to make sure taxpayers’ money is only spent on healthcare that works and is good value. Since Nice was set up in 1999 we have said yes to 91% of the cancer drugs we have looked at. The cost to the NHS of providing these cancer drugs to patients is approximately £337.18 million per year. "Nice multiple appraisals take 12 - 18 months to complete once they have been referred to us by the Department of Health. Our single (rapid appraisals) take an average six months to complete, these appraisals are for newly licensed treatments and we are able to publish guidance to the NHS within months of the new drug getting a licence." "It's bizarre. Here I am, a mum, a wife, sitting in my little office in Chester taking on this huge monster the NHS. I can't really believe it. But I'll never give up on a patient, ever. And I think that's what's important, that a patient feels like there is somebody there who won't give up on them, and I won't give up on them."